Perfect for tonight’s dinner. 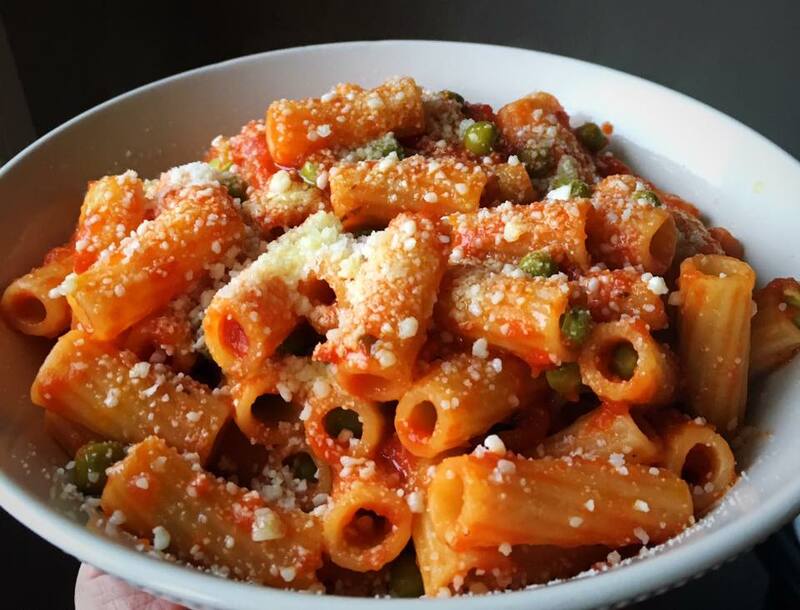 You’ll need just a couple ingredients to make my Rigatoni with Spicy Sauce and Peas. You can adjust the heat level in this recipe, the longer you simmer the sauce the more the peppers heat will intensify. Don’t like spicy, just leave out the red pepper flakes. Easy pea-sy! Add the olive oil to a large 12″ skillet with the onion, garlic, red pepper and saute for 5 minutes. Do not burn the garlic. Add the tomatoes, salt, pepper and bring this to a boil. Lower to a simmer and cook the sauce for 15 minutes. Add the peas and cook another 5 minutes. Strain and add the pasta to the sauce folding it into the sauce for 2 minutes on a medium heat. Remove from the heat, let sit for 1-minute and toss with 1/4 cup of Romano cheese and a drizzle of olive oil. Serve with more cheese and olive oil on the side. This recipe will serve 4 people. Some nice Italian bread and a simple salad is all that needed to go with this pasta dish.